I can trace my inspiration for this cookie to two sources. The first was a recent trip to the Momofuku Milk Bar in Brooklyn with my daughter. First of all, who can resist the name of the place? It just sounds promising — milk and bar and…Momofuku, what? 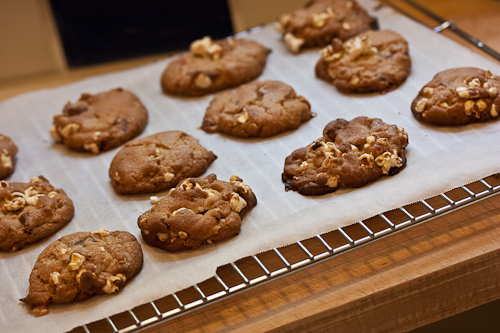 But the store comes from the crazy baker brain of Christina Tosi, pastry chef at the famous Momofuku restaurants, who concocts baked goods with names like Crack Pie, Cereal Milk Ice Cream, and Compost Cookies. 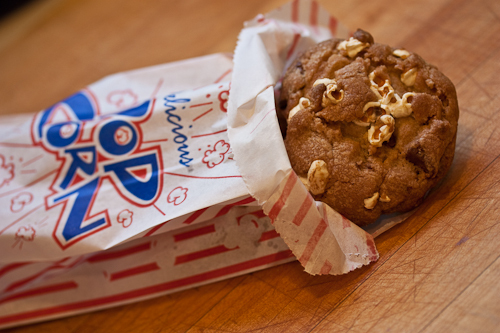 Even though her Compost Cookie has pretzels and graham crackers (among other things), I imagined it was going to have popcorn so I got that on my mind. The toffee just came along with. 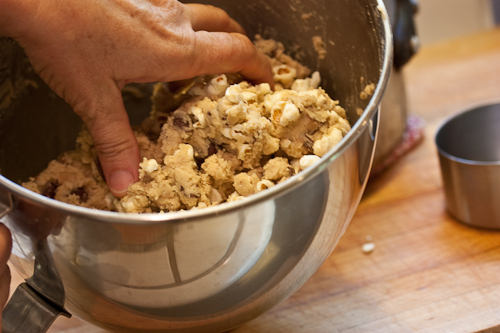 Second inspiration comes from Sylvia, who works with my husband — she may not realize it but she has accidentally put me to the challenge of creating a new cookie for the annual office summer barbecue. Last year I brought Mexican Chocolate Chip Cookies, which had been invented for the previous year. This year had to be new! 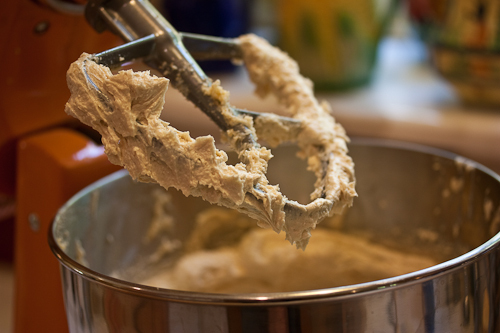 Using a standing mixer, cream the butter. Add the sugars and beat at medium speed for 2 to 3 minutes. Scrape down the sides. Add the egg and vanilla and beat at medium speed for 7 to 8 minutes, scraping down the sides a couple of times. In a bowl combine the flour, soda and salt. 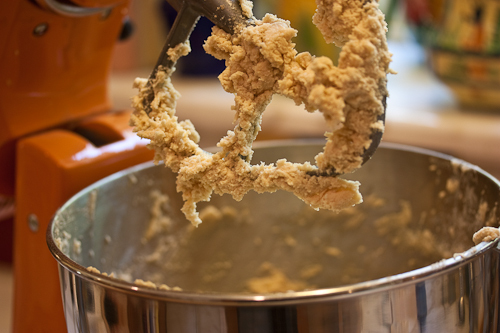 Add to the butter mixture and beat on low to just combine. 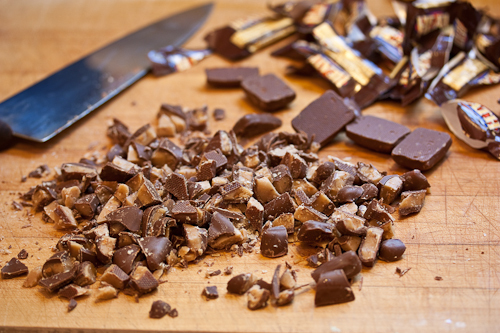 Fold in the toffee pieces, then fold in the popcorn. 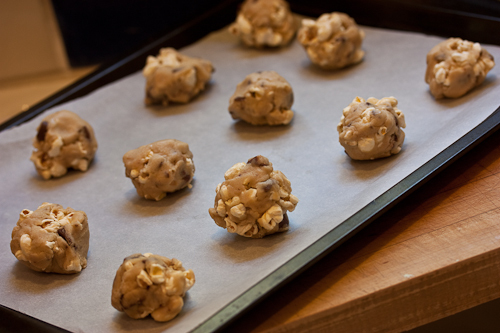 Form into balls and arrange in a single layer on a baking sheet. Cover lightly with plastic wrap and refrigerate for at least an hour, or up to overnight. Preheat the oven to 375°F. 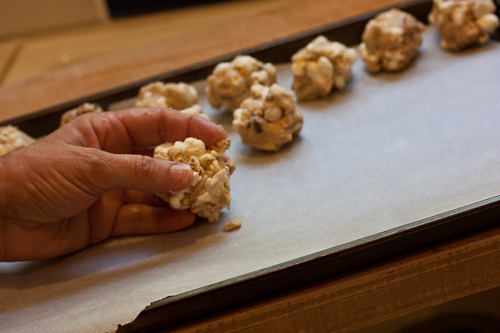 Grease a cookie sheet or use parchment under the cookies. 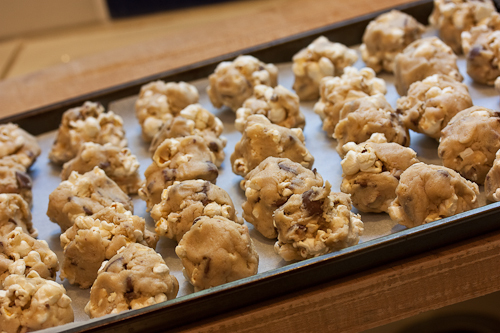 Arrange the chilled cookie dough balls on the baking sheet, leaving several inches between each cookie. Keep the rest of the dough refrigerated. 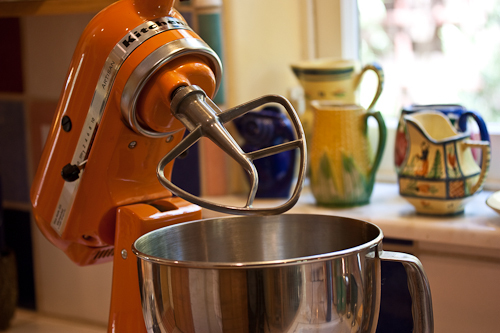 Bake the cookies for 12 to 14 minutes, or until browning on the edges. They won’t stay on the rack very long!